A veritable sea of callbacks and references, Dissidia 012[duodecim] Final Fantasy is about what is expected from a massive crossover game. Whether this is a good thing or not depends a great deal on what your personal feelings are towards the Final Fantasy series, but thankfully, the underlying mechanics are solid enough that even those who find the constant self-reference tiresome should find something to enjoy. Dissidia Duodecim is a game with a steep learning curve, omnipresent loading times, and a rather disjointed plot, but it also presents a wonderfully deep combat system and a pool of content so huge that it borders on the absurd. But given how heavily the game relies on its combat system, how much a player will enjoy Dissidia Duodecim depends a lot on how eager they are for a fast paced battle. The story of Dissidia Duodecim is certainly one of its weaker points. The basic plot is that a war has been raging between Chaos, the god of discord, and Cosmos, the goddess of order. Each deity has summoned up champions to defend them in the form of heroes and villains from the Final Fantasy universe, with suitably epic confrontations ensuing. The cycle of battle has been repeating now for ages, with winners and losers being resurrected to fight the same battles over and over. By the 12th cycle, Cosmos is in a bad position, with Chaos having gained the support of semi-sentient copies of the warriors of chaos and order known as Manikins. Cosmos responds to this threat by granting her champions shards of her divine power in the hope that her heroes will be able to manifest Crystals with which to turn back the darkness and end the cycle of battle. 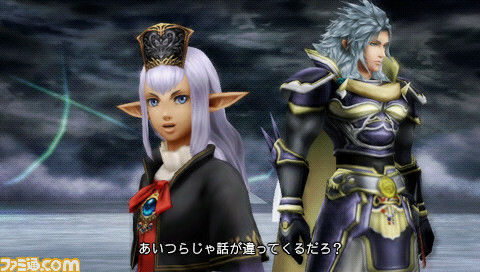 However, given that Duodecim is a prequel to the original Dissidia, failure is pretty much a foregone conclusion. It’s not quite as much of a downer ending as it could be, largely thanks to the inclusion of an expanded and extended version of the original Dissidia. Presented in Duodecim as Scenario 013, the original plotline has received a significant tweaking, basically amounting to a minor remake. 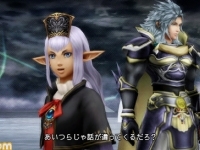 This presents some problems of its own — the brand-new 012 scenario is only about 2/3rds as long as the original Dissidia’s 013, which will no doubt disappoint fans who were hoping for more original story content — but by and large, the inclusion of more or less the entire original game is an impressive feat, and a solid selling point for players who missed the first game. Combat can be downright confusing at first, but the game does a decent job of introducing things a bit at a time. On the whole, the plot of Dissidia Duodecim is a bit of a sprawling mess, with plot threads flailing every which way. The game is split up into chapters, with each Cosmos-aligned character getting their own section to star in. The idea of a story told from multiple viewpoints is an interesting one, but with more than a dozen viewpoint characters and two or more vaguely identified narrators attempting vainly to connect chapters to one another, the story quickly becomes massively disjointed. Even basic chronology becomes a serious challenge as the stories begin to overlap, with events that are seen from multiple viewpoints being edited strangely in order to avoid having the game repeat itself. On the whole, Dissidia Duodecim’s plot doesn’t sink so low as to be an excuse for random combat, but it is confusing, flailing, and often has difficulty presenting a consistent narrative. From the viewpoint of basic design, it’s pretty clear that the combat system is where the vast majority of attention was paid. The combat system itself verges on the absurdly complex, with a surprisingly large number of interlocking systems, sub-systems, and in-combat elements, which results in a rather steep learning curve. At its most basic, players are expected to use two types of attacks to target an opponent’s two primary stats, Brave and HP. The Brave and HP stats are interconnected, in that a player’s Brave determines how much damage an HP attack will cause, while a Brave attack will drain the opponent’s Brave, thus allowing the player to land a bigger HP hit. In essence, players are expected to pump up their Brave before unleashing a burst of damage with an HP attack. 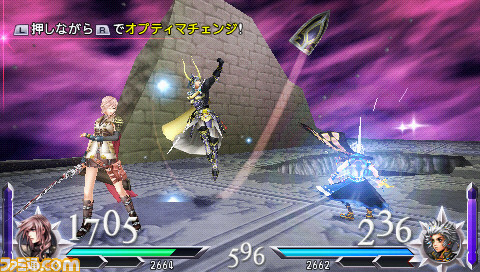 In practice, players also need to keep track of their EX Gauge, which acts as a sort of Limit Break, Stage Bravery, which acts as a lump-sum Bravery prize for the first player to completely drain the opponent’s Bravery, and an Assist Gauge, which allows the player to call in an ally for a one-time support move. All this is on top of any stage-specific hazards, of which there are a wide variety. The combat system can be a bit difficult to get a grip on at first, but once past the initial test drive period, battles become delightfully strategic and acrobatic. As players acquire more and more equipment, the game begins to allow for some wonderfully creative character builds, which become very useful once the player unlocks some of the postgame content. Once past the 012 and 013 scenarios, the sheer volume of content available in Dissidia Duodecim becomes apparent. Beyond the normal story scenarios and one-on-one quick battles, the game offers: the Labyrinth, a card-based hunt for unique equipment; extra arcade modes; Reports that feature loads of background material and one-off battles; and an extra “What If” story full of high level challenges in the 000 scenario. In a nutshell, the combat system can be difficult to get into at first, but there are great rewards in store for players that tough it out. Thankfully, control is very solid in combat, and menus are perfectly serviceable, if a little bit overly segregated. Each character has their own menu, with its own access to equipment, abilities, shops, game options, and so on. The inability to jump from one character’s menu to another’s isn’t usually a huge issue, but it does become a bit irritating when the player has control over a full party. Individually managing each character’s setup can be quite time consuming, especially given Dissidia Duodecim’s problems with constant, omnipresent loading. A full data install does cut this down somewhat, but even then, players can expect to see long load times before every battle, whenever the party leader is changed, or just whenever the player looks at the game funny. It presents an interesting juxtaposition: inside combat, hair-raising split-second battles. Outside of combat, you have all the time in the world. As with the storyline, Dissidia Duodecim’s soundtrack is mostly made up of references to other Final Fantasy games. In this case, that means lots of remixes of songs from various titles in the series, as well as a fair number of tunes pulled directly from those games. The wide variety of music works exceptionally well in setting the mood for various battles, but the lack of a strong overarching style makes it difficult to tie the 8 and 16-bit tunes to the hard-driving electric guitar remixes. The other major feature of Dissidia Duodecim’s audio is the extensive voice acting, both in and out of combat. Overall, the voice acting is fairly solid, and surprisingly extensive for a game on a portable system, but suffers from a very stilted, Captain Kirk-style delivery, with significant pauses doing horrible things to the flow of dialogue. Dissidia Duodecim’s cutscene animation and direction is well above average. Visually, Dissidia Duodecim flows far better. Although the changes in character design throughout the series are rather blatantly obvious here, they are slaved to an overall visual design that manages to tie them all together, albeit fairly loosely. On the whole, the biggest issue with the game visually is the extremely limited number of settings. Characters and cutscenes visit, on the whole, about a dozen fairly small arenas over the course of the game plus an overworld map, which leads to a great deal of repetition in setting. Taken as a whole, the game’s visuals are pretty solid, with good character models and reasonable art direction, though the repetition does get a bit bothersome. But perhaps the best thing Dissidia Duodecim has to offer is the sheer volume of content it presents. The two main scenarios will take around thirty five hours to complete when combined, but the game offers a much longer optional third scenario that allows the player free reign in constructing a party and exploring the world of Dissidia, which could easily put the game over sixty hours. 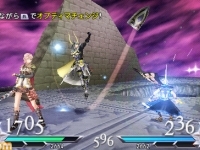 On top of that, Dissidia Duodecim offers quick battle and arcade modes, a unique Labyrinth mode that has the player explore an enormous dungeon with randomly generated enemies and party members, and a number of other combat options. Players also have the ability to create and trade quests and challenges of their own, giving players what amounts to an endless supply of new content. The one flaw in this combat cornucopia is the game’s extremely weak online support, as most of the game’s player to player connectivity is, as with so many PSP games, ad hoc only. Dissidia 012[duodecim] Final Fantasy is a game that really lives and dies on its combat system. For players looking for an active, complicated combat system with a lot of character customization, this game is pretty much everything worth asking for, but the aimless, reference-laiden plot just doesn’t measure up. It seems a bit of a waste that, despite having access to one of the richest series histories in gaming, the best Dissidia Duodecim could come up with is, essentially, the character arcs of the Final Fantasy leads rehashed as short stories. Still, as a game aimed squarely at the brains of Final Fantasy fans, Dissidia Duodecim kind of works. This game was played to completion using a publisher-provided review copy.